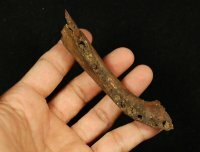 Late Miocene Alligator Jaw w/ Teeth [REP469] : Fossils Online, Welcome! This jaw section has 9 intact teeth is from the same late Miocene site as the rhino fosssil found elsewhere in our catalogs. The jaw section is as found --- none of the teeth have been added after the fact. Some are unerupted teeth that were underneath the functional teeth that have since broken. Very heavily mineralized. Most alligator jaws that are offered are from the Pleistocene so this is definitely a rarity.